Reggae Hostel Ocho Rios i Ocho Ríos, Jamaica: Reservér nu! Chill, Vibe and Connect at Reggae Hostel Ocho Rios! Chill with us in comfortable rooms and dorms, lounge areas with free wifi. Vibe with us as we create an enjoyable social environment full of activities. Connect through our links to local life delivering rich experiences! Ocho Rios is the perfect base from which to explore the North Coast. 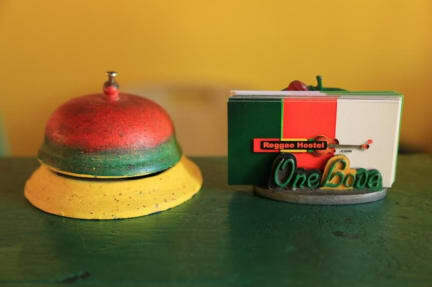 Reggae Hostel is situated near the center of town within easy walk of everything. We are just 100 meters away from the main beach and there are other beaches within easy reach. The social vibe at the hostel makes it easy for you to meet other guests from all over the world and share adventures. The lush hills and valleys around Ocho Rios provides an amazing backdrop that will take your breath away. There are hidden gems around Ocho Rios that will dazzle you and our front desk will help you get there! Each evening chill on our roof top lounge to the sounds of reggae music and compare stories of your days adventures. Later let's party together at nearby nightclubs or soundsystem reggae events. After we will head to the market and eat street food. Ocho Rios has a strong local character and we will show you where it is found. A vibrant town with a lot of great local food with probably the best Rasta vegan selection of restaurants. There is a shared kitchen where you can prepare your own food. There are nearby supermarkets where you can buy all types of food and there is a traditional farmers market in the middle of town where you can buy fresh Jamaican produce. We have a great combination of rooms that range from large air conditioned dorms, private rooms with cable TV and kitchenette to basic budget rooms. All rooms have enuite bathrooms. Come and enjoy our hospitality we are looking forward to seeing you!